NEW! 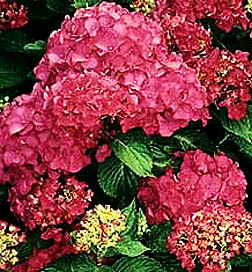 Hydrangea macrophylla Forever Pink In our book the best dwarf hydrangea is ?Forever Pink?. Blooming one month earlier then other hydrangeas (June) and continuing till frost. The color change from Neon Pink to Deep Red in cooler weather, is about as stunning as they come. ?Forever Pink? grows to a height of 2 to 3 feet with compact spread of 3 feet. The glossy rich green foliage stays green until frost, making it the perfect plant for a specimen, foundation, and hedge planting. Hydrangeas once the plant of choice for flowering shrubs is now making a comeback with the younger generation. Hydrangeas continue to be among the showiest of summer and autumn flowering woody plants. They are shade tolerant and grow well on the shady side of a building or under trees. Planted as specimens, or massed together for stunning borders. The dried flower heads are often used in flower arrangements.